Holiday Look With A Halloween Polish! 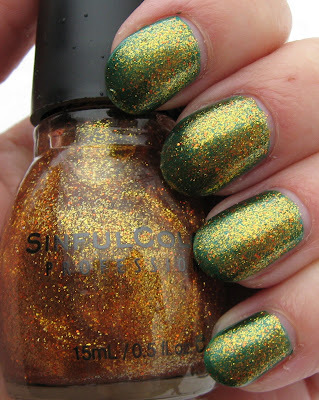 Above & Below: Fright Night's Green Claw Polish layered with Sinful's All About You. It matches some of the ornaments I have in a basket! Below: Outdoors and in darker indoor lighting, the gold becomes the more prominant color. An amazing transformation! I couldn't take my eyes off of this ever-changing combination. Below: Back to the indoor shots (with a flash, unfortunately). Below: Bottle pictures of what I used. 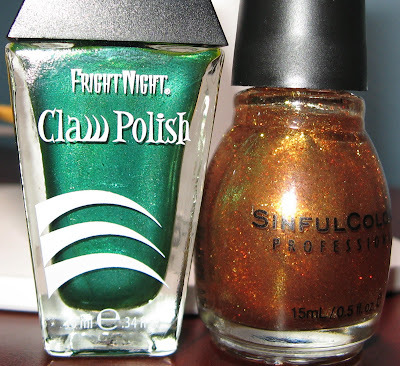 Fright Night's Green Claw Polish works not only for Halloween, but for Christmas too! 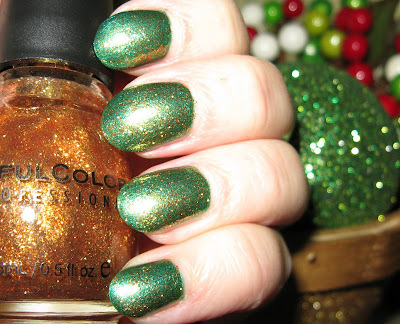 It would also do nicely as a St. Patrick's Day polish. 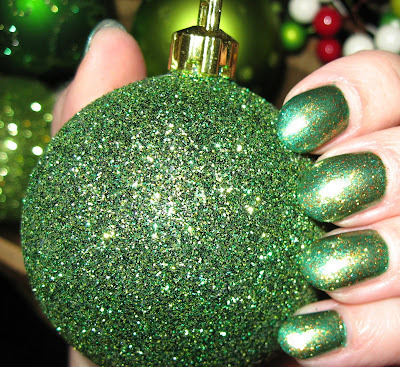 I used 2 coats of the green claw polish and 2 coats of one of the newer Sinful glitters, All About You, for this festive look. I took so many photos trying to captures the true look, especially what it looks like in lower lighting, but never really got an accurate one. In the house, the gold takes on a look like something I've never seen. The green becomes secondary and the gold appears as a mesh film with just a hint of the green peeking through. It reminded me of Color Club's Wild & Willing, the way the gold lays over the color. 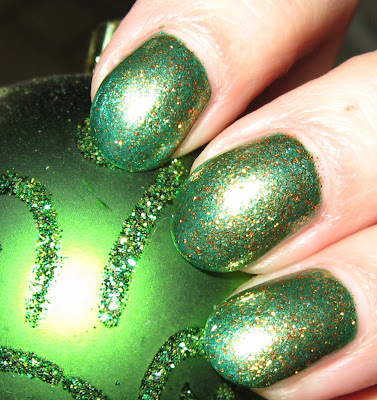 In brighter lighting, this look reminds me of a Christmas Tree with little colored lights. My husband really liked the way this combination looked, and when I told him both of the polishes only ran $1.99 each, he questioned why I bother buying much higher priced ones as well. Well, hmmm, it's hard to explain, but I know at least you all understand! How beautiful is this combination. Love this gold coming thru the green. Love your Christmas balls also. I have to try this combination. I don't have either polish but I'm sure I have something like them. All About You is simply awesome!!! That combination is so pretty!!! I would have never thought to put this combo together but seeing it now is amazing! I love the way it looks against that ornament. neat, i did a mani similar to this a couple of days ago. 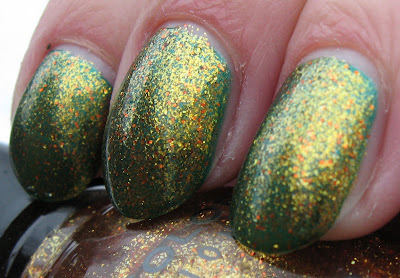 i used zoya suvi as a base,then i added about three coats of all about you-i couldn't keep my eyes of my fingers. Augusta~that sounds pretty. Some combinations are just so appealing that I agree, you can't stop looking at them! Mighty Lambchop~I was so surprised with this Sinful, just beautiful! adorepink~this Sinful one kept catching my eye sitting on the shelf, so I just had to see it 'on'. Love it! gildedangel~it looks so much better in real life. I was disappointed with the photos. Park Avenue~isn't it amazing? So glad I tried it! Lucy~All About You is definitely worth hunting down. It's totally unique.